We’ve got some great overstocks of pop up paper vases for sale. 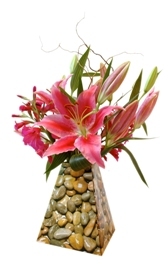 This excess inventory makes an ideal add-on gift when purchasing flowers, or simply as a stylish addition to your home. Let me know if you would like to buy it. Pricing is ex-tax, ex-Brisbane, Australia. The ultimate waterproof paper vase overstocks…. This excess inventory is the perfect solution when you need somewhere to put a large amount of congratulatory flowers…. It is fully recyclable, and is manufactured without harmful emissions and comes in eight different designs to suit any occasion and location. The best part about these vases are that they are so portable! Because they fold up flat, you can take them wherever you go. The other thing about vases that is interesting is that they are never there when you need them. You take a nice bunch of flowers to someone and all their vases are already full, or they don’t have a vase to put your nice flowers in. By using a paper vase instead of relying for someone else’s existing vase, you can guarantee that they will have a nice paper vase to use for their beautiful flowers. If you are planning a party and want to delight your guests with individual table decorations, then these pop-up paper vases are just the thing! The paper vases are also known as a folding vase, because it folds up flat when you are not using it, to save space in the household or hospital.